Beidahuang (literally, “Great Northern Wilderness”) is a vast region of mostly farmland in China’s northeastern Heilongjiang Province. Back in the 1950s, tens of thousands of retired soldiers, educated youths and revolutionaries worked hard there to introduce agriculture to the wild land. Today, Beidahuang has become China’s most modern and productive grain production base. But like other rural areas in the country, Beidahuang faces a shortage of labor. 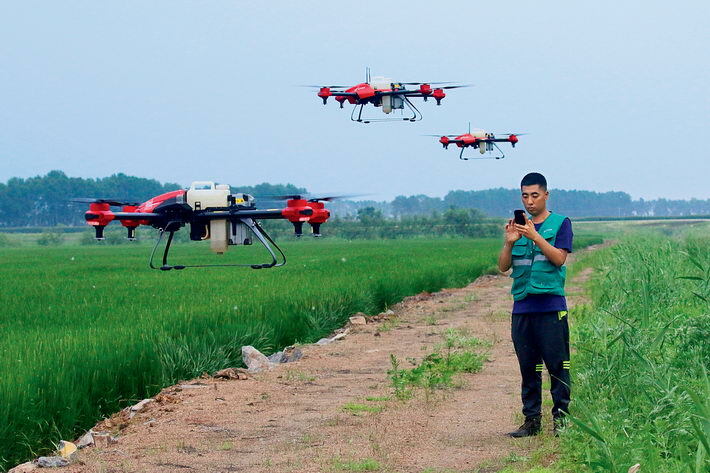 In recent years, however, a new profession involving drone-driven crop protection has emerged, which has greatly relieved the situation and cultivated a new generation of Chinese farmers. Thanks to China’s reform and opening up, the country urbanized fast, which resulted in a loss of demographic dividends in rural areas. Standard wages to hire farm help have more than doubled in recent years. Even so, rural areas still lack enough hands during harvest season. 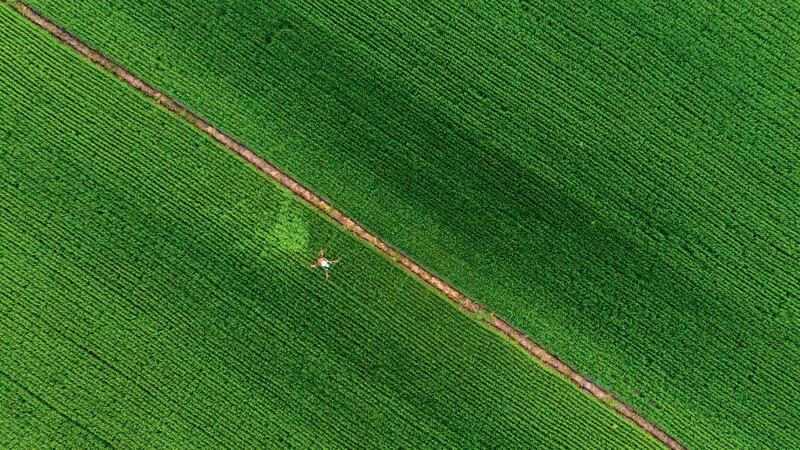 Three years ago, crop protection drones carrying automatic spraying machines began to fly over the fields of Beidahuang. Zhao Liqing was born into a farmer’s family in Baoqing County, Heilongjiang Province. When he was young, he was hired by a company in town. Later, a series of preferential policies issued by the Chinese government inspired him to leave his job to become a professional farmer. Currently, he manages 400 mu (26.67 hectares) of rice fields. “Sowing seeds and harvesting rice have also been mechanized,” Zhao adds. “Without such machines, I could never farm such a large area.” Agricultural technologies help him earn a net income of 800,000 yuan per year. Under the scorching sun, 26-year-old Zhang Bo sat leisurely on a ridge with a remote control, setting flight parameters. After a while, a drone rose up over the field to spray pesticides along a default route. Zhang does this every day as a professional drone operator. Before 2017 when he lived in Tianjin City, he became a Weibo (China’s version of Twitter) celebrity by live streaming content about video games. His family was selling agricultural machinery and farm implements in Suibin County, Heilongjiang Province. In 2017, his father started exploring the idea of purchasing a drone to use for farming, so Zhang agreed to return home to learn crop protection technology using drones. The operation of crop protection drones is not complicated, so it came easy for the video game player. “Actually, my former job earned more money and was more comfortable than farming,” admits Zhang. “But this is more fun.” After realizing how easy the formerly toilsome task of planting has become, he believes that new technology is going to change the game further and that agriculture will soon become a promising and “cool” industry. Not far from Zhang in Tongjiang County, Li Dan is another drone operator. She used to manage a hotel in Harbin, capital of Heilongjiang Province. People in her family introduced her to the new occupation. She also believes the realm has a bright future, so she learned the technology and bought some equipment. During peak season, Li works from 3 a.m. to 9 p.m., spraying pesticides for 700 mu (46.67 hectares) of farmland every day on average. Despite exhausting and intense working conditions, the job is fulfilling as well as economically rewarding. Her family now manages 300 mu (20 hectares) of farmland, and Li intends to lease more fields next year. A saying in Beidahuang goes: “Those born in the 1970s don’t want to farm, those from the 1980s cannot farm and those of the 1990s are reluctant to even talk about farming.” Similar phenomena have occurred in China’s other rural areas. Most farmers do not want their children to be farmers. If current trends continue, the country will have insufficient farming labor in 10 years. But the application of drone technology could possibly provide a solution to the issue. Growing up in an era of information technology, people born after the 1980s have a natural inclination to more tightly embrace modern technology like drones. Additionally, with strong sensitivity about intelligent agriculture and big data, some young drone operators are setting up comprehensive service platforms for farmers featuring cutting-edge technologies, which earn them impressive incomes while remaining attractive to young people in particular. Born in 1993, Wang Feng returned to his hometown in Heilongjiang Province after graduating from college to take over his father’s business of selling agricultural supplies. 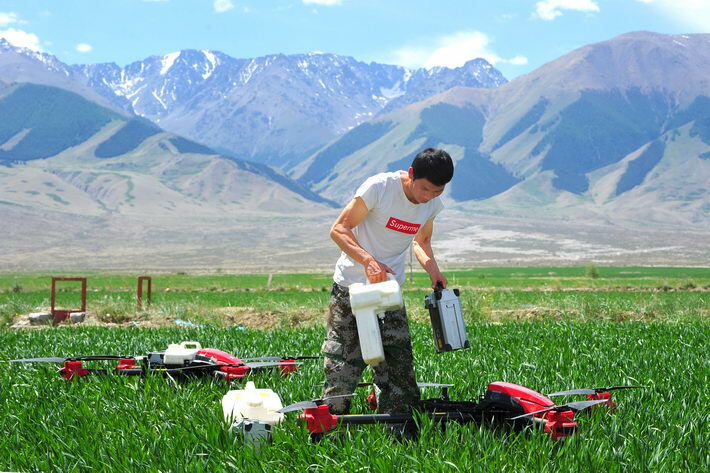 Due to his passion for drones, Wang set up a flight team to provide crop protection services. Based on big data, his team provides one-package service including plowing, seeding, managing, harvesting and storing. Most of his 40 employees hail from local villages and are in their twenties or thirties. In 2016, more than 6,000 drones were used for crop protection in China and by 2017, the number exceeded 10,000. The same year, the Ministry of Agriculture, the Ministry of Finance and the Civil Aviation Administration of China jointly declared that they would provide subsidies for crop protection drone operation in six pilot provinces and municipalities. It is expected that in the near future, the usage of drones in crop protection will grow rapidly. And what’s more important is that the application of drones may attract more young people to further explore intelligent agriculture.